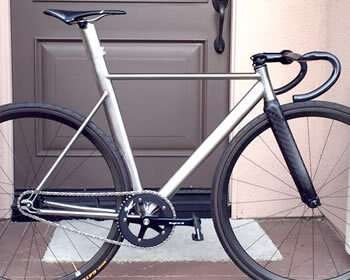 Waltly has been building titanium frames using only aerospace grade seamless 3Al-2.5V tubing since 2009, fulfilling custom orders for individuals as well as large OEM orders for bike companies. Our frames are covered by a limited lifetime warranty. 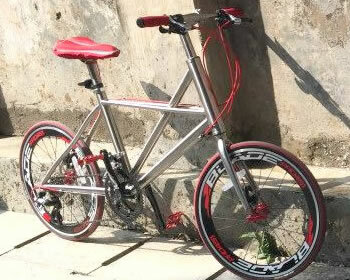 If you are interested in a custom titanium bicycle frame, we are here to serve you. 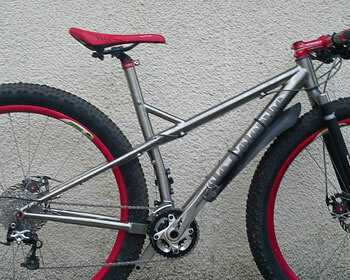 Send us measurements and specifications from your preferred bike or a sketch of what you want. Use our frame price estimate form for fastest service. Your personal information will help us select the best tubing size and wall thickness to maximize your performance and comfort. We will respond with a price quote. Pay a 30% nonrefundable deposit via PayPal or wire transfer and our draftsmen will design your frame and create CAD drawings for your approval, including details like the locations of fittings and options. We will make revisions as requested until you are satisfied that the frame design fulfills your wishes and requirements. Once you approve the final design, we will begin the fabrication process based on the final CAD drawings. 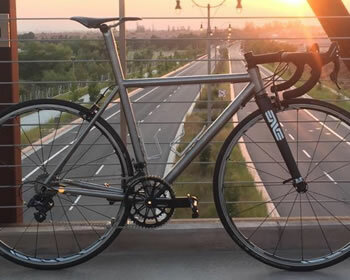 Please note that depending on how far we are into the fabrication process, additional design changes requested after this point may be difficult and/or add significantly to the cost of the frame. 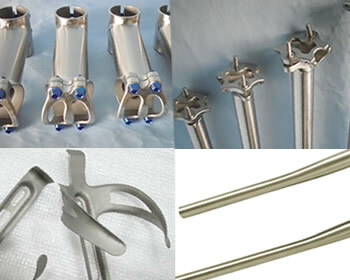 Tubing is precisely cut and mitered, then TIG-welded by experienced craftsmen. 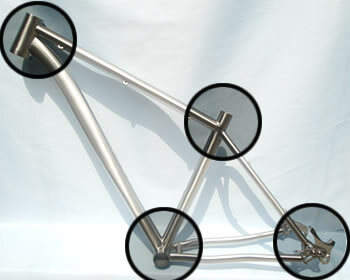 We perform quality assurance checks for frame alignment and ream and face the head tube and bottom bracket. Typical build time is 35 to 45 days after the order was placed. We will email you photos of the frame as it nears completion. 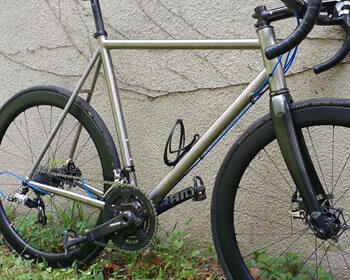 Your personal custom logo can be imprinted on the downtube, top tube and/or head tube for a nominal fee. Send us your graphics in the following formats: Adobe Illustrator, SVG or high resolution 150-300 dpi JPG or PNG. After the frame is sandblasted or brushed, the logo is imprinted with the contrasting process. Once the balance is paid, the frame is securely packed and shipped internationally with full insurance coverage against loss or damage. You will be provided with the tracking number. EMS and DHL are our preferred shipping providers. Delivery is 7 to 10 working days after shipment. Titanium is half the weight of steel, so titanium tubing can be made with slightly larger diameters without a weight penalty. 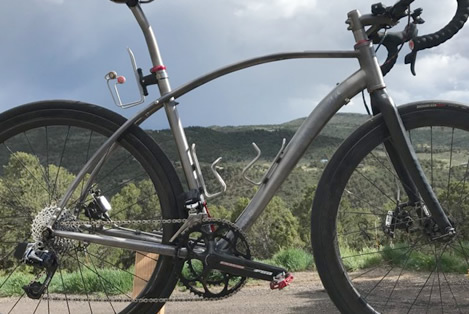 Larger diameter tubing provides greater stiffness to efficiently transfer power to the rear wheel without undue flex, all without beating you up over the course of a long ride. It's a magical combination of efficiency and compliance, with geometry, add-ons and options tailored to the wishes of the customer, something that can only be done with metal frames. We also offer tubing with ovalized and special hydroformed cross sections to further fine-tune the properties of the frame. 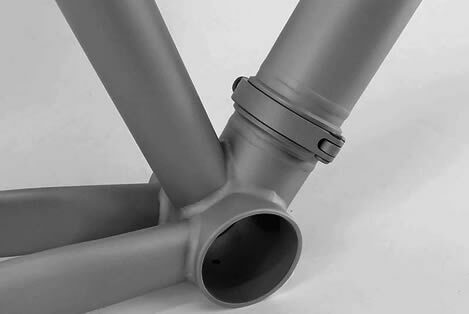 Because aluminum is much weaker and less stiff, aluminum tubing for bicycle frames needs to be large diameter to provide acceptable fatigue life. 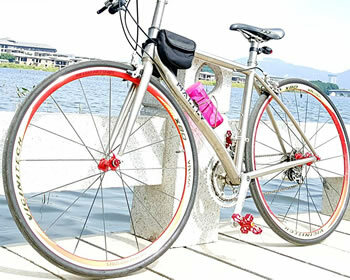 That usually creates a ride that can be harsh and tiring, especially when used with narrow, high pressure road tires. 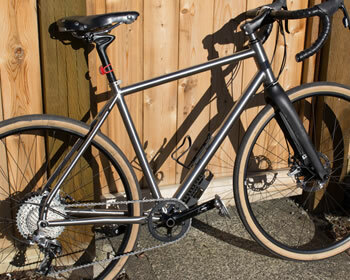 Titanium has enough strength and fatigue resistance to avoid very oversized tubes, providing a compliant, resilient ride on rough surfaces that smooths out and absorbs road buzz and small bumps alike. 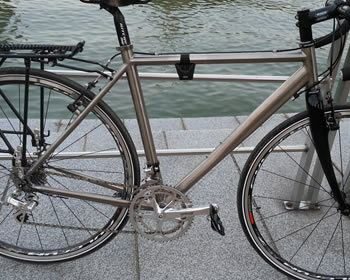 Steel frames, with their smaller tubes, can be almost as compliant, but aren't quite as comfortable. 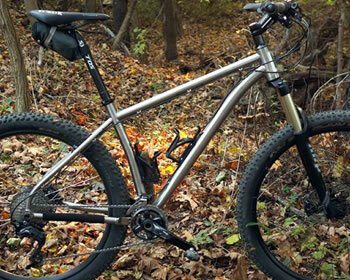 Steel may be real, but titanium is magical. Titanium is even more corrosion resistant than stainless steel. It can be painted or - unlike steel or aluminum - can be left without paint, powdercoat or plating, so you never need to worry about scratches. Internal cable routing is simple because the insides of the tubes are naturally impervious to rust and corrosion. 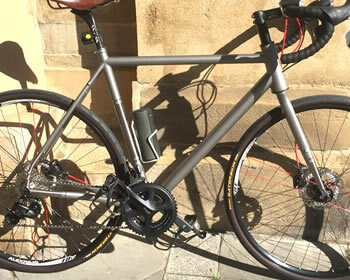 Unlike aluminum, titanium has a fatigue limit, so as long as the tubing is not stressed beyond this limit or damaged, it will never fatigue. Titanium can also flex three times further than aluminum and twice as far as steel without permanent damage. Carbon fiber is very vulnerable to crash and notch damage, after which it may fail catastrophically. The epoxy matrix also degrades over the years with exposure to the UV in sunlight. A titanium frame can literally last the rest of your life, and longer. 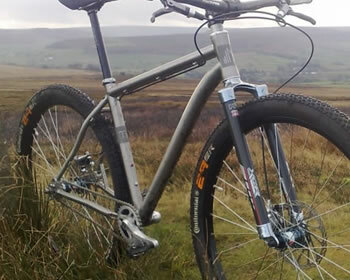 The following is a small selection of the custom titanium frames we have built. Please note that these complete bikes were built up by customers. We neither sell nor assemble complete bicycles. 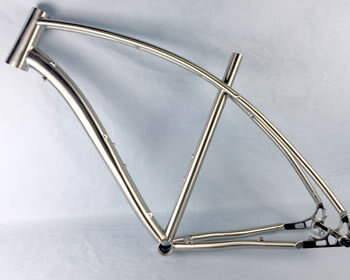 Our frames and forks are custom-made to your specifications and are covered by our limited lifetime warranty. 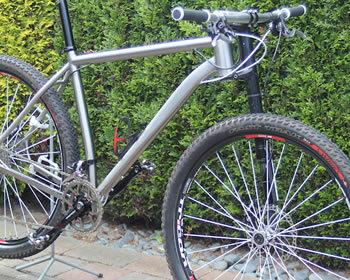 We now offer mounting solutions on our custom road frames and forks for Shimano and SRAM flat mount disc brakes. 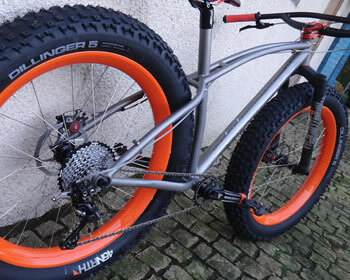 We support 148mm and 110mm dropout spacing options for mountain bike Boost hubs. 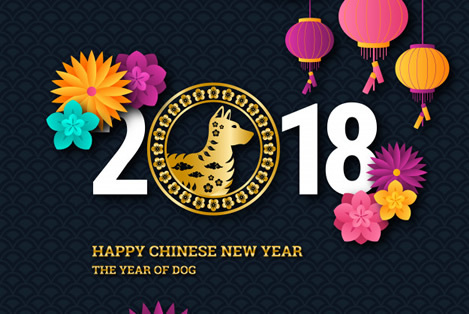 Our offices and factory will be closed from February 13th through the 22nd for the Spring Festival (Chinese New Year) national holiday. Manufacturing and shipping will pause during this period and customer service will be unavailable. We apologize for any inconvenience and thank you for your understanding. We would be happy to discuss your special needs and desires for that one of a kind frame built especially for you. For fastest service, please download the custom price estimate form PDF below and fill out as much information as you can, then upload it using our contact form. Alternatively, you may also upload sketches or CAD files. What can we make for you? For OEM production inquiries, please visit our Alibaba page. © 2017 Waltly Titanium Technology (Xiamen) Co., Ltd.